Hi there. I am making a chastable for out Priest, for Easter I have got the White Patterned Silk for the item, and he would like it lined in pale blue should I use saten lining or will the two put together be a bit slipery.. The first time I have made a chastable and am a little concerned. 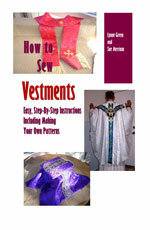 Yes, satin will work well for lining any chasuble, including one that is made from silk. But be aware that silk frays easily (it is loosely woven and comes to pieces), so you will need to zig zag stitch all around the piece to keep it from fraying. Then the silk should work just fine for the chasuble.